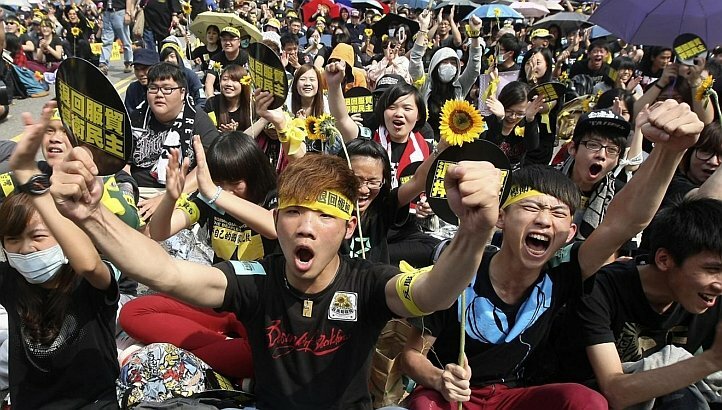 More than 100,000 people in Taiwan have taken to the streets of capital Taipei, to protest against a controversial trade agreement with China. They carried signs reading “defend democracy, withdraw the trade deal”. President Ma Ying-jeou insists the deal will bring economic benefits, but campaigners says it will make Taiwan too economically dependent on China. The protesters expressed support for students who have occupied parliament for two weeks in protest at the deal. The agreement will allow China and Taiwan to invest more freely in each other’s services markets. The protesters say it will hurt small businesses and job opportunities for local people, and should be scrapped. They are also demanding that the government pass a law to monitor all future deals with Beijing. In recent days, President Ma Ying-jeou has made several concessions, including supporting such a law and agreeing to a line-by-line review of the deal in the legislature. But he says the pact should not be cancelled, because it will give Taiwanese companies greater access to the Chinese market. Business groups and others have voiced support for the deal. The governing Kuomintang party says it is determined to ratify it. The agreement, which was signed in June 2013, has not yet been approved by lawmakers. China formally regards Taiwan as a part of its territory, despite the island governing itself for six decades. But China is Taiwan’s biggest trading partner and in recent years ties between the two have improved. They have signed several trade and investment agreements – but some fear greater economic integration with China could threaten Taiwan.